In 2016, the Union Art Gallery showcased artwork from 10 Milwaukee private collections. In Part II of the exhibition we are showing 10 new collections from the Milwaukee and Chicago Areas. 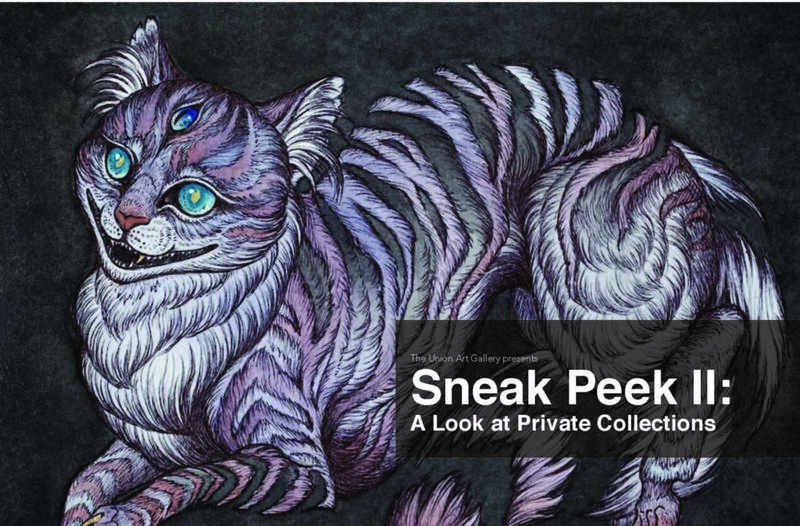 Sneak Peek Part II: showcases the unique and various ways in which these local collectors began their own collections and how their interests influence their personal collections. Collecting original artwork does not need to be expensive or rarified, but can support artists and reflect what is important to you. Come see all the different ways these collectors have gathered art and find ideas to begin your own collection. Exhibiting collectors: Jody Alexander, Marna Goldstein Brauner, Donna & Michael Flanagan,Yevgeniya Kaganovich, Anna Kupiecki, Fatima Laster, Kevin Miyazaki & Marilu Knode, John Riepenhoff, Erasmo Salgado and John Sobczak. Exhibition Opened from Jan 22-Feb 15th. Free and Open to the Public!